Back in Feb I shared a very special YouTube of Tina self-defending herself, and she just sent me a heretofore unseen SECOND video of the same event back in 2008. Christmas done come early, because this one is even better. You don’t reaaaallllly need sound, but I recommend. Tina, you’re kind of a badass. Let’s go troll around Underground after dark and see how your moves hold up. Ahhhh, Unagi. 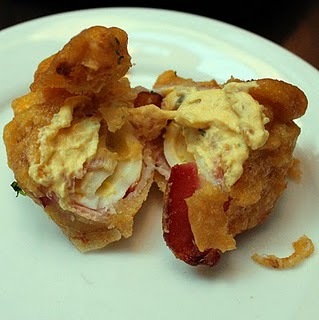 Fried bacon-wrapped deviled eggs. If someone would like to whip these up, I would be more than happy to try them. I’ll follow it up with a visit to a cardiologist, but I’m pretty sure these would be worth it. It’s too hot to write any more. Happy Weekend!! Baxter, out. This entry was posted on June 10, 2011 at 2:59 pm	and is filed under Arbitrary. Tagged: don't mess with Miranda, food, Friday, fried bacon, LOL, my faves, summa time. You can follow any responses to this entry through the RSS 2.0 feed. You can leave a response, or trackback from your own site. 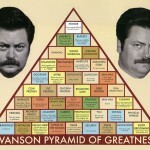 You’ve covered all your favorite subjects: fried food, Tina, Kate. Well done.